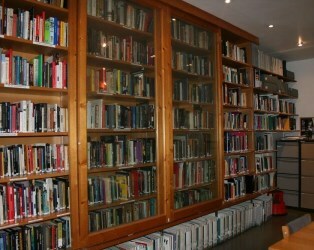 Named in honour of Tiernan MacBride in recognition of his contribution to the Irish film industry, the Library holds one of the largest collections of film related publications in Ireland. The collection includes a wide range of books, journals, and reports covering both international and Irish cinema. 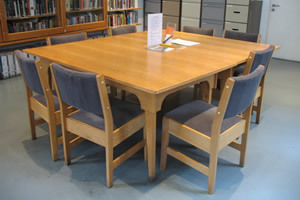 The Library holds over 3,500 books, covering all aspects of film history, criticism, theory and production. The collection includes books on film genre and theory, gender studies, film production and scriptwriting, international filmmakers and actors, the history of early and silent cinema, and national cinemas. The library has a large selection of books relating to Irish cinema and television, and aims to purchase all new publications on Irish film written in the English language. The periodical collection includes publications dating from the 1930s to the present. The major international journals such as Film Quarterly, Sight & Sound, and Variety are includedCurrently the Library subscribes to Film Ireland, Sight & Sound, Screen, American Cinematographer, Variety and Cineaste., as well as specialist periodicals like American Cinematographer. The Library also holds Irish film magazines from different eras, including The Screen, Film West and Film Ireland. The collection also includes back issues of many other publications, including Monthly Film Bulletin, Film West, Empire and The Screen. Most journals articles are searchable in the Library via the FIAF International Index to Film Periodicals. The Library also subscribes to The Irish Times digital archive, giving access to every issue published since 1859. This resource is particularly useful for researchers interested in the history of Irish film production and exhibition, censorship, and contemporary reaction to Irish and foreign films. You are welcome to visit the Library outside of these opening hours by appointment. Please contact Raven Cooke, Library & Special Collections Manager at rcooke@irishfilm.ie for more information. Browse the current catalogue available in the Library. If there is something in particular that you cannot find, our Librarian will be happy to help. General public €2.00 per visit. Membership can be purchased at the Tiernan MacBride Library, and costs €20/€15 for concessions. Annual subscriptions to the Library are available to Third Level Colleges; please contact the Librarian for further details. The Library’s collections are reference only, however photocopying facilities are available.